IWP websites are constructed with two goals in mind – producing successful leads for your business and to become a helpful insurance resource to your current and prospective clients. Using elements of progressive web design, these websites are quick to load and provide users with a pleasant browsing experience. Using our many years of experience in web marketing and developing websites for business professionals, we streamlined every website to make contacting you as easy as possible for your viewers. Take a look at our demo website to get a feel for it yourself! Easy to use and quick to learn template-based system. Customize the subpages of your templates or use them as-is. We are redefining the term "Template". Every visitor that leaves a message or contacts you via web form on your website goes into your own private database. You can visit your database at any time to follow up on leads easily by referring to your Contact Management System. Roughly 80% of all searches are local based. Your website is designed to take advantage of local optimization capabilities for higher rankings on top search engines. Apply localized custom page titles, descriptions, and keywords to optimize your website for consumers' local searches! Integrate your favorite comparative rater into your website at no extra cost. Built-in Content Management System comes with integration of custom forms anywhere on your site, giving you more control over your marketing. Every website is equipped with a "60-Second" quote form to help visitors request their insurance quotes quickly and easily. Studies have shown that a long quote form is rarely filled out. The main goal of your website is to simply have a Consumer contact you to seek out your expert advice. Your website will make sure the visitor can quickly obtain your contact information if they are not finding their answers on your website. Your contact information is always visible and easy for visitors to find. Nobody likes to wait and wait while a website loads.These websites are optimized for quick load times, meaning no frustrated visitors! 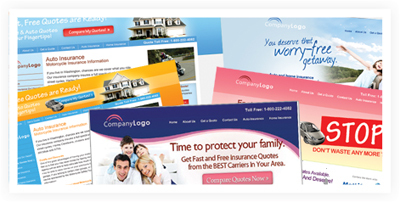 Each website theme utilizes elements of modern web design to give your visitors a pleasant online experience. New viewers will enjoy reading and interacting with your website! Each website is streamlined for ease of use, by keeping your client's needs in mind. Never will they struggle to find the information that they need from you!